Do you have the berries to drink a pink beer? That’s the question being asked by Granville Island Brewing as its gets set to introduce the locals to False Creek Raspberry Ale – a fresh new seasonal addition to their beer lineup. Inspired by the urban summer, this refreshing ale is named after the iconic Vancouver neighborhood and ultimate summer playground. 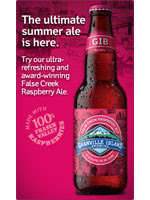 Formerly a six-week big bottle Limited Release, False Creek Raspberry Ale is now available in 6-pack format as part of GIB’s summer portfolio. From June to August, guys and gals can enjoy the delicious taste of this craft brew while testing its food pairing versatility at the same time. False Creek Raspberry Ale brings out the flavours in dishes as simple as a fresh summer salad. Lightly prepared proteins like smoked chicken taste even better when there’s a hint of raspberry lingering on your tongue. For the ultimate summer feast, pair a pint of False Creek Raspberry Ale with your grilled salmon burger with fruit salsa! In addition, participating pubs, bars and restaurants will feature new False Creek Raspberry Ale trivia coasters, featuring fun and prizes for local beer drinkers. GIB is also offering its social media followers a chance to be at the exclusive launch party for False Creek Raspberry Ale on June 7th at the GIB taproom. False Creek Raspberry Ale will be available while summer lasts in liquor stores throughout Metro Vancouver, the GIB taproom and retail store, and on tap at selected locations including the Kingston Pub, Boathouse restaurants in English Bay and Kitsilano, selected Brown’s Social House location and all Cactus Clubs. Available in 341ml 6-pack bottles for $12.25 and on tap at select locations around the city. For more information on GIB, visit www.gib.ca or www.facebook.com/granvilleislandbrewing or follow us on Twitter at www.twitter.com/itsgoodtobehere.